The B747 was produced sode by side with the B777 for nearly two decades. The Il-96 wasn´t build in large numbers because western "advisers" told Jelzin that in a market economy you can´t subzidize companies. So no money for russian producers. In the meantime Airbus and Böing received 20+ Billion from Washington and Brussels, respectively. Hole wrote: The B747 was produced sode by side with the B777 for nearly two decades. Even if they marketed Il-96 (e.g. in ex-USSR or Eastern Countries/Africa) nobody would buy it as the Boeing 767, 777 and A330, 340 were better options. Il-96 was never going to be efficient on Aeroflot long haul routes vs. 777-200ER or -300ER. because of the tense atmosphere between NATO and Russia, somewhere down the road Russia might even to denied purchase of 777Fs, if this happens what will be Russia's alternative? many here claim Il-96 is old and outdated, so is there actually a plan by Russia to develop their own NEW long range wide body airliner that can also be converted for cargo purposes? Russia can't just sit this one out, there is a high demand for these types of aircrafts today and for many years to come. Russia did a big mistake by not putting into large serial production IL-96 and Tu-214/204 , Till now they would have got better variants of two. Austin wrote: Russia did a big mistake by not putting into large serial production IL-96 and Tu-214/204 , Till now they would have got better variants of two. what happened is unfortunate, but is Russia doing something to address this problem? Plus there are now state-owned banks and leasing companies that help russian airlines. Only thing missing are politicans who go aorund the world and threaten smaller countries with wars if they don´t buy russian jets. Thanks. i was kinda hoping though that Russia pursue its 777f analog by its own, but i guess in difficult times Russia has no other better option than to partner with China. I am not against Russia-China collaboration, but of course the more Russia can do by its own, the better. They lease money for that shity SSJ which is a western plane that russia only put togather. They should either stop it or make it full russian. At first I though it was the case but it isn't. which Russia puts together. Did you ever bother to inform yourself about the SSJ? Does not sound like it. All the foreign components are no indication of "pre-fab" assembly in Russia. I saw that 66% of the engine are of western tech. Look the picture in your second source basically everything is from the west. Sukhoi provide the plastic for the fuselage. Every critical systems are from other companies. Russia has no other better option than to partner with China. I am not against Russia-China collaboration, but of course the more Russia can do by its own, the better. Actually collaboration with China is a very good thing. China does not impose sanctions on Russia regarding morality or this or that elected official in China or Russia, and more importantly the joint venture creates a product with two significant markets, where the alternative is perhaps China builds a competing item for their domestic market that they will try to compete on the international market with... against anything the Russians might build. China needs the tech and know how to build large planes, which Russia has. The SSJ 100 is a typical "modern" plane. Parts from all over the world. And it was supposed to be that way to win customers from western countries. MOSCOW, July 28. /TASS/. Russian Prime Minister Dmitry Medvedev has signed a decree on providing investments from the budget for the United Aircraft Corporation (UAC) amounting to 1.32 bln rubles ($21 mln) to finance the production of Il-96-400M passenger airliner, according to the document released on the government’s website on Saturday. "The signed decree provides budget investments amounting to 1.32 bln rubles for the United Aircraft Corporation. The funds will be allocated to reconstruction and technical upgrading of the Il-96-400M passenger airliner construction. The project will be commissioned in 2020," an explanatory note to the decree said. The project is estimated at 1.47 bln rubles ($23 mln), with 1.32 bln rubles ($21 mln) being federal budget funds. Any ideas what will come out of this project? Upgrade of production, so retooling of factories perhaps? Is it safe to assume that Il-96 400M orders will increase after this? development will apply to the update to the IL-96-X. Discussion about video screens on passenger chairs is inane. There is no question that such details will be updated. fuselage redesign and unnecessary cost. May as well do a new aircraft design from scratch. kvs agree 100 % , They should first ban buying any new Foreign type be that be boeing or airbus and this should start from Aeroflot. This is nothing short of Treasonous when Russia is under more than 45 different sanction from west. You dont reach 1st till you reach 2nd ... so suggesting Russia should not buy more IL-96-400M till they can build as good as A-350 is a loosing game. This is the same problem we face in India where we keep importing hoping someday what we make will catch up the best of the world and this is a never breaking cycle. United Aircraft Corporation (UAC) on July 30, 2018 published a photo of the first pilot prototype of the passenger turboprop Il-114-300 under construction. The signature reads: "The prototype IL-114-300 in the hangar of the branch of PJSC" IL "in Zhukovsky, where its assembly is based on the existing reserve. The completion of work on the aircraft is planned after 2020". 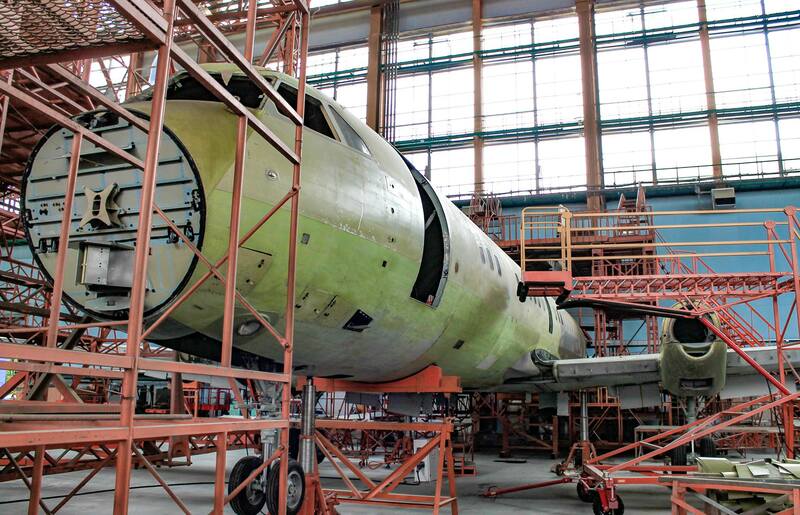 Further, the UAC releases the release of "Il-114-300 will be produced in Lukhovitsy on the production site of the RAC" MiG ". As a power plant for the reconstructed aircraft, the perspective engines TV7-117ST will be used, which are tested at the flying IL-76LL laboratory. " The Il-96-400 can do what the A350 can. And it shouldnt matter even if its 10 times as inferior, they should not fund their mortal geopolitical and economic enemies. Also by buying Russian, this will increase the GDP so Russian aircraft companies can create aircraft superior to airbus. That's how the west won. France encouraged its citizens to buy citroen and peugeot no matter how inferior they were to Ford or mercedes, and that's how france is an automotive superpower.